Making sure that your glassware in the bar is clean and polished is very important to maintaining a clean and professional atmosphere in the restaurant. It is also especially important to do it quickly. The Bar Maid GP100 Glass Polisher can help you achieve these goals. 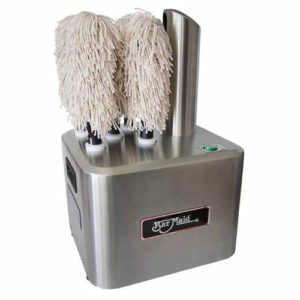 The Bar Maid GP-100 Glass Polisher is capable of helping bar-backs polish up to 300 glasses per hour, and it has rotating polishing heads that polish both the inside and outside of the glass for a consistent polish. As the glass is simultaneously being polished, a continuous flow of warm air hits the polishing heads to keep them dry for an effective polishing. The polishing heads are easily removable and dishwasher safe for easy cleaning.